Deli is a China professional office supply manufacturer. We are able to provide a variety of office supplies such as stapler, desktop set, paper punch, pencil sharpener, etc. 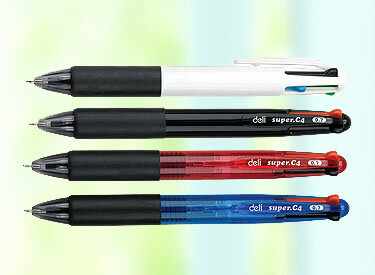 This is our ball pen, you can find other similar products of different functions by clicking the below icons. Welcome you to browse and choose! 1. Hard wearing and not east to be damaged. 2. New type ink: so our ball pens has smooth and clear writing. 3. Ball pens with different colors are provided to satisfy different needs. 4. It feels comfortable to hold the ball pen, so you will not feel tired after writing for a long time. Ballpoint pens (ball pen, rollerball pen), pencils and gel pens are all familiar to us. We began to use them when we are child. Deli Group can provide a wide range of writing instruments (ball pen, pencil, gel pen, whiteboard marker, marker pen and highlighter etc.). Besides, as a professional stationery supplier, we can also provide many other office supplies: office filing products, office stationery (Bookbinding tools, cutters and desk stationery) and office appliance (paper supplies, commercial machines and adhesives & tapes) etc. » Gel Pen 1. ABS material is adopted to make our gel pen (gel ink pen).